The State Council, China's cabinet, on Saturday released an amended regulation for the implementation of a revised individual income tax law, paving the way for the most significant overhaul of the country's individual income tax code in two decades. Offering substantial tax cuts for individual taxpayers through a higher tax-free threshold and more tax-deductible expenses, the revised regulation and law are expected to help boost domestic spending and consumer confidence at a time when the Chinese economy faces increasing downward pressure, Chinese analysts said. But the sweeping reform requires a speedy, efficient implementation process, they noted. 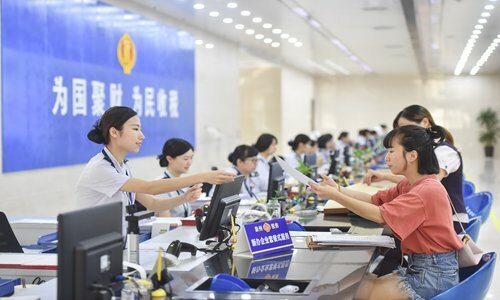 The amended regulation released by the State Council included major revisions such as bigger incentives for qualified foreign workers in China, special tax-deductible expenses and tax-filing procedures, according to the website of the State Council. Under the amended regulation, for example, taxpayers can file for tax deductions for expenses in areas including qualified supplemental pensions, commercial health insurance, child education, elderly care, healthcare and housing. The amended regulation is part of China's push to overhaul the individual income tax system and is aimed at ensuring the smooth implementation of a revised individual income tax law adopted by China's top legislative body in August. The National People's Congress Standing Committee on August 31 approved the revised tax code, which contains adjustments in areas such as determination of taxable income, tax brackets, the tax-free threshold and tax-deductible expenses. The amended regulations and the new individual income tax law, slated to take effect on January 1, mark the most significant overhaul of the system since 1994 and are set to reduce the burden on taxpayers. Individuals who earn 10,000 yuan or less would pay almost zero income tax, Xinhua said. Apart from the deductions, the tax code also has a tax-free threshold from 3,500 yuan ($513) to 5,000 yuan a month, which went into effect on October 1. "This is no doubt a big bonus for taxpayers," Li Daxiao, chief economist at Shenzhen-based Yingda Securities, told the Global Times on Sunday. The measures will help boost consumption and consumer confidence in the economy, Li noted. "The timing of these announcements couldn't be better," he said. The tax overhaul comes as the Chinese economy hits downward pressure and consumption - a major driving force for GDP growth - has shown troubling signs in recent months. Growth for total retail sales in China has slowed for three consecutive months, according to data from the National Bureau of Statistics. In November retail sales grew 8.1 percent year-on-year, the weakest pace of the year. Slower retail growth has had Chinese policymakers scrambling for measures to stabilize consumption and thus domestic demand, which they deem a crucial step to counter deteriorating domestic growth and overseas markets. The tone-setting Central Economic Work Conference, which ended on Friday, vowed to improve consumption by implementing tax reform. "Lowering taxes is the most direct way to boost consumption. Lower taxes mean more disposable income and stronger spending," said Cao Heping, a professor of economics at Peking University. Apart from lowering taxes, the new individual tax code could also achieve another key policy goal: improving consumer confidence and market sentiment, Cao told the Global Times on Sunday. "There is no other way to boost confidence than announcing a tax cut," Cao said. Still, for taxpayers to see the real impact on their incomes from the tax bill, a speedy and efficient implementation process is of paramount importance, analysts stressed. "I understand this is a very complex and comprehensive reform, but if we can't carry it out properly then it won't make any difference," Cao said. The overhaul poses daunting tasks for officials at all levels, he noted. Changes are required in determining taxable income, tax deductible expenses and rates, collecting taxes and filing returns. A Beijing resident who preferred to be named only by her family name Chen said although she'd heard about the tax cuts, she didn't know how the new system would work. "We'll see how it goes, but I hope it will not be too complicated," she told the Global Times on Sunday. She said she had never filed taxes herself as until now her company had always handled it.